With the calendar turning to November, many teachers are removing October decorations from their classroom doors and hallways. 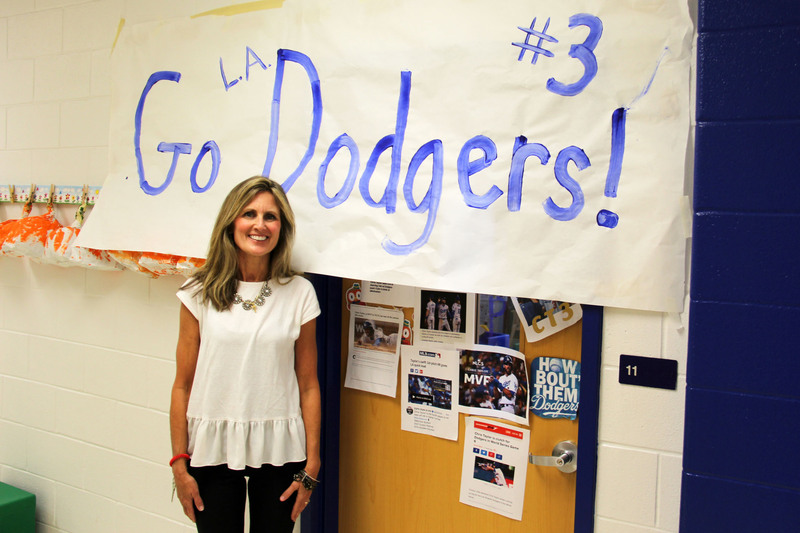 With Game 7 of the World Series tonight, Bayside Elementary preschool teacher Mary Taylor is keeping up her decorations a little longer. 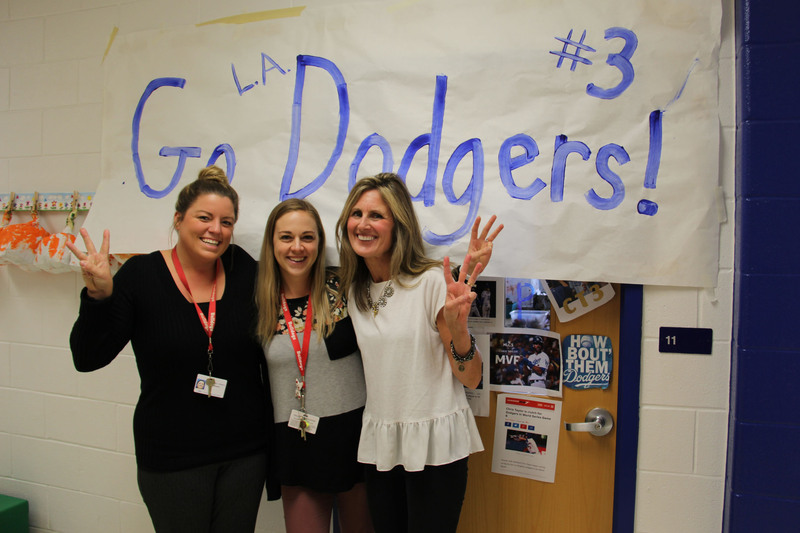 Her colleagues Kristen Daugherty and Brooke Gadberry have been adding articles and photos of Taylor’s son, Los Angeles Dodgers outfielder and Cox High School graduate Chris Taylor, to the classroom door throughout the postseason. A large banner – large enough that adults have to duck to enter the room – with Chris’ jersey number was recently added to the door. That Friday, Mary and her husband Chris Sr., Chris’ father, were bound for Houston to see World Series Games 3, 4 and 5 in person. They ended up only seeing two of the three games. They walked into their Houston hotel just in time to see the last at bat for the Houston Astros to win Game 3. “Excited” is the word she used to describe her reaction to seeing her son, from her den in Virginia Beach, hit an RBI double to tie Game 6, a game the Dodgers won to even the series and force tonight’s Game 7. That’s what she reminds Chris of on game days. “I’ll text him, like today, I’ll tell him good luck and enjoy playing with this great team,” she said. How is the Major League Baseball player’s mom feeling about the final game? And just like her students at Bayside, Mary loves that Chris is still learning. 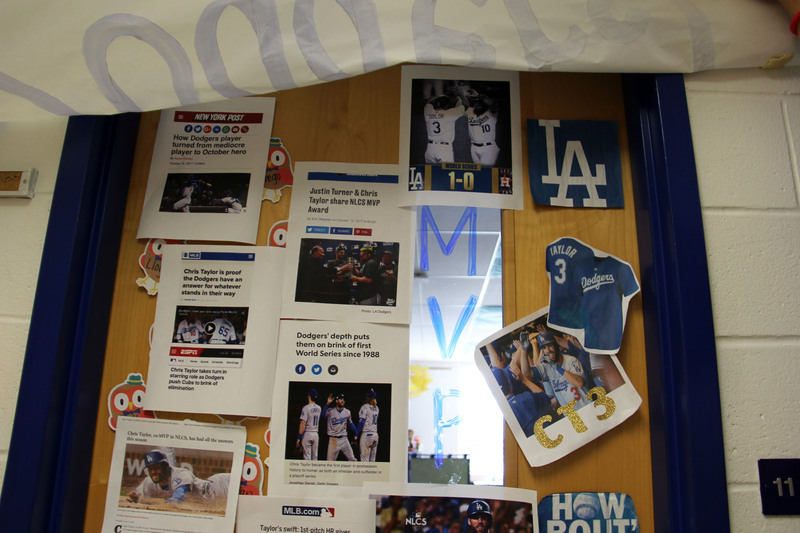 If there’s a Dodgers win in Game 7, Mary has no idea what her colleagues have in store for door decorations. She’s just focused on Game 7 – just like her son and his teammates. I can remember when he first started playing but haven’t kept up since I retired. But my husband has, and watched all the games. I know you are proud of his accomplishments. Enjoy his time at home. I have known Chris Jr since he was 9 years old in the baseball and wrestling community. The Taylor family is filled with outstanding people and athletes, from grandpa Armon to dad Chris to Uncle Mike, Chris Jr comes with a strong pedigree. His efforts in MLB bring honor and a spotlight to his family, the VB baseball community, and to all those who played with and against him. We are all proud of Chris Jr and hope he enjoys a lengthy and enjoyable career living the dream!